Mayor Rahm Emanuel and the United States Hispanic Chamber of Commerce (USHCC), the country’s largest Hispanic business organization, announced that Chicago will be the host city for the organization’s 34th Annual National Convention. The three-day convention is slated to take place September 15 – 17, 2013, at the historic Hilton Chicago hotel. Following a competitive selection process, the USHCC unanimously selected Chicago as the next location for the chamber’s 34th Annual National Convention. The USHCC Convention is known as the largest gathering of Hispanic business leaders in America, attracting business associations, entrepreneurs, corporate executives, chamber leaders and members, Hispanic business enterprises (HBE’s), and policymakers from across the United States. 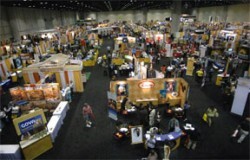 Approximately 7,000 attendees are expected in Chicago for the program.